How did head coach Andy Enfield get a supermodel to marry him? On Saturday, a day removed from his team's stunning upset of No. 2-seeded Georgetown, the 43-year-old coach who has been called "the most interesting college coach in the world" told the story to reporters gathered here. Warning: It will make a lot of readers even more jealous. Another warning: It involves Taco Bell. Sadly, Enfield didn't quite recall the year it happened. "St. John's played Virginia [in the NIT]," he said. "Whatever year that was." Amanda Marcum, in addition to being a successful model, was a huge Oklahoma State basketball fan. So much so that she would go to bars in New York by herself and watch games. She had tickets to the Cowboys' NCAA tournament appearance in Boston, but she didn't have a ride from New York. Fortunately (for Enfield), she had a friend who knew a guy who had worked for the Celtics and Rick Pitino. The friend asked Enfield if he was going to the tournament. He was, and he offered to drive the friend and his friend, who turned out to be his future wife. "I pulled up to the Starbucks in Manhattan to pick them up," Enfield said, "and as soon as I saw Amanda get into my car, I knew it would be a good trip." That it was. The two had basketball in their blood, and most of that drive was spent talking about the game. "It was very natural," Marcum said at halftime last night. "We had so much in common. He had a great sense of humor." It also helped that Oklahoma State won, beating Penn in the first round. The love and basketball theme continued during their first actual date – the aforementioned NIT game pitting St. John's against Virginia. It was Enfield's idea to go, and he wanted to take his date to a nice restaurant beforehand. So they went looking for a place. Problem was, Enfield didn't know Queens all that well, and he struggled to find anything he thought worthy of the occasion. As fate would have it, the only restaurant open was … Taco Bell. So Andy Enfield, New York hotshot, wooed Amanda Marcum, international swimsuit model, by making a run for the border in Queens. "I got her a nice burrito," Enfield said. Six months later, they were engaged. At least he popped the question at a fancy Fifth Avenue restaurant, rather than a Sbarro at Terminal 6 at JFK airport. "What a sacrifice she has made," Enfield said Saturday, "from flying all over the world to do fashion shoots for some of the biggest designers on the planet to moving to Tallahassee, Florida, which is a nice place, but it's not New York and it's not Milan and it's not Sydney and it's not Paris." No, it's not. (Though it does have a Taco Bell.) Marcum admitted to the Naples News in 2011 that the transition from New York to Tallahassee and then to Ft. Myers wasn't always easy. "I don't want to complain about it," she said, "but at times it has been a struggle. The timing with me having a baby and him getting a new job has been challenging. But we've made it work." Asked on Friday whether she misses modeling, Marcum said, "Sometimes." But she added, "I love being home." Will there be a different definition of "home" anytime soon? Enfield will surely be a hot candidate for open coaching positions, especially if the Eagles become the first-ever 15 seed to make the Sweet 16. Asked before he arrived here this week about possible opportunities, Enfield said he wasn't thinking about that. "Our goal is to make this program better than it was before," he said. "I left the NBA and we had three small children. We wanted to be around college campuses, to have our kids grow up in this kind of atmosphere. 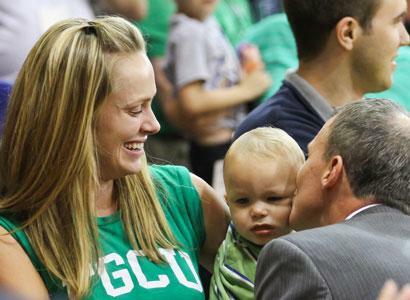 Florida Gulf Coast provides a chance to win at a high level." That they've done. And 10 years later, the Enfields are celebrating the way they started: at March Madness. Welcome to happily ever after.